Series is the sum of all the numbers of the sequence. Generally it is written as Sn. 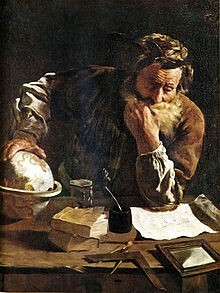 The first known summation of an infinite series was produced by Greek mathematician Archimedes which is still used in the area of calculus today. Mathematicians from Kerala, India studied infinite series in around 1350 CE. We use the sigma notation that is, the Greek symbol “Σ” for the series which means “sum up”. The series 4+8+12+16+20+24 can be expressed as ∑6n = 1 = 4n. We read this expression as the sum of 4n as n goes from 1 to 6. This is the compact form of the series so we can generate the terms of the series by the formula easily. 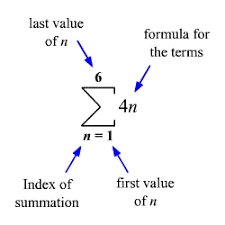 To generate the terms of the series given in sigma notation above we have to replace the n with 1, 2,3,4,5 and 6 as the last number of term is 6. It is an ordered list of numbers. It is the value which we get by adding up the terms of the sequences. A series which have a limited number of terms is called Finite Series. A series which have unlimited number of terms is called Infinite Series. If we have a sum of a series which is approaching towards a finite value is called a Convergent Series. And if a sum does not converge then it is called divergent series. A series ∑an is said to converge or to be convergent when the sequence (sk) of partial sums has a finite limit. If the limit of sk is infinite or does not exist, the series is said to diverge. Find whether the series is convergent or divergent. But if this is not true then it would be  a divergent series. This is the test to check whether a series is convergent or divergent. This tells us that these series are either diverges to positive infinity or they are going to converge to finite value. that is, if the larger series converges then the smaller series also converges. that is, if the smaller series diverges then the larger series also diverges. The series are not only differentiated by their convergence or divergence but also by the properties of the term an . When an is a non-negative real number for every n, the sequence SN of partial sums is non-decreasing. It follows that a series ∑an with non-negative terms converges if and only if the sequence SN of partial sums is bounded. and a telescopic sum argument implies that the partial sums are bounded by 2.
converges. This is sufficient to guarantee not only that the original series converges to a limit, but also that any reordering of it converges to the same limit. which is convergent, but the series formed by taking the absolute value of each term is the divergent harmonic series. The summation of the terms of the arithmetic sequence is the arithmetic series that is, if the difference between the every term to the next term is always constant then it is said to be an arithmetic series. where a is the first term of the series and d is the difference of it which is known as the common difference of the given series. Find the sum of the first ten terms of the given arithmetic series. The summation of the terms of the geometric sequence is the geometric series that is, if the ratio between the every term to the next term is always constant then it is said to be a geometric series. Where, a is the first term of the series and r is the common ratio for it. Where, n is the number of the term. If the value of the common ratio r lies in between 0 and 1 or IrI < 1, then the geometric series is said to be convergent. 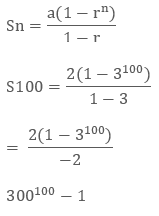 And, if the value of r ≥ 1, then the series is diverges. How can we get answer 1 of an infinite series? All the terms from 1/4 onwards will be cancelled out. Solution: To find the sum of the series first we need to expand the series. Find the sum of infinite geometric series. It is just the infinite sum of the harmonic sequence. There is no special formula for finding the sum of the harmonic series so we can calculate the sum of the arithmetic series and then take the reciprocal of it which will be the sum of the harmonic series. The harmonic series is divergent to infinity. Fibonacci series is the sum of Fibonacci sequence. It is the series of the numbers in which we get the next number by adding the two numbers before it.